The PV® 231EQ dual 31-band 2/3 octave graphic EQ brings together both quality features and great pricing. The 231EQ gives users the ability to select between 0-6 dB or 0-12 dB cut, or boost, on 31 bands of frequencies ranging from 20 Hz to 20 kHz. This graphic EQ also has a low cut filter switch, with status LED, that helps remove rumble from open mics. Another great feature is the bypass switch, with LED indicator, which is very convenient when doing sound checks. Bottom line, this EQ gives you the ability to finely tune your PA system for any venue or application. 5.87" x 20.5" x 9.62"
Peavey PV231EQ 31 Band Graphic Equalizer. 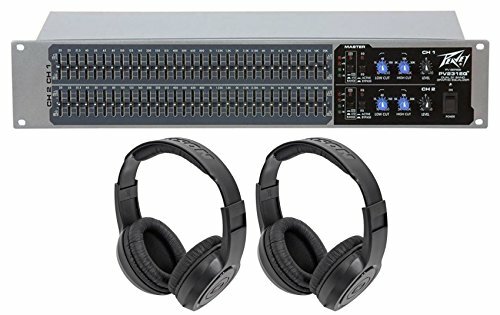 2 RU dual 31-band. Switchable 12-band or 6 dB boost/cut range. Variable 24 dB low cut filter. Variable 24 dB high cut filter. XLR balanced I/O. Output level LEDs. Bypass switch with status LED. Center-detent control sliders. Constant Q filters. Ground lift switch. Samson SR350 Over Ear Closed Back Studio Reference Monitoring Stereo Headphones . Lightweight design ideal for music recording, practice and listening. Powerful audio performance. Over-ear, closed back design with cushioned ear cups. 35mm drivers with rare earth magnets. Adjustable padded headband. 20Hz-20kHz frequency range. 1/4" adapter included. Hear the Difference: Samson's SR350 Stereo Headphones provide quality bass performance and excellent sound isolation in a lightweight, over-ear design. The wide cushioning on its ear pads and adjustable headband provide serious comfort, while a low-profile fit makes the SR350s ideal for everything from home listening to fitness applications. Ear Bud Upgrade: The SR350s are a solid introduction to the superior audio quality provided by over-ear headphones. They make an excellent gift for the music lovers still using their supplied smartphone ear buds.